"If you have the luxury of being able to purchase a new construction home do yourself a favor and go see Tundra Homes. I have barely moved into my dream home and don't plan to ever move out but I'm ready to build another home with them just for the experience. I learned a lot from them and I really enjoyed the process. Everyone at Tundra is very personable but beyond that, their integrity and commitment to excellence is second to no one. This was my first new construction experience and they were extremely patient. They suggested items to me that I never would have thought of and my house is better as a result. There was never any pressure to select upgrades and for some features, they even suggested lower cost options that worked better for my home. My home is a Mallory II with one significant difference: I had one of the garage bays converted into a "casita" which allowed me to add a Spanish courtyard complete with a wrought iron gate. I had the best of both worlds - an existing floor plan that looks and feels like a custom home. I am so comfortable recommending Tundra Homes. I am delighted beyond belief with how my home turned out." "I would definitely recommend you, Tundra Homes. I did a ton of research before picking you. Couldn't find a single complaint. After meeting you, I liked you all right off the bat. I really felt I was in good hands from the beginning and my father and girlfriend said the same thing. That feeling never went away. " We recently moved into our new home built by Tundra Homes and are extremely happy with the results. The time involved from start to finish was impressive. All personnel involved, from office staff to onsite management and sub-contractors, provided quality work in a timely manner. We received helpful guidance on the purchase of features within the home to make it unique to our desires. It was exciting to follow the construction progress through Tundra Homes' online program, Builders Trend. We had access to the payment schedule and draws due, could track payments made, request improvements through a change order, and see pictures of different stages of construction. Overall, we have been kept well-informed along the way and would like to thank everyone who helped make this a stress-free and satisfying experience. "Thank you for creating my DREAM HOME! You made every part of this process go smoothly. Building a home from 1200 miles away could have been a nightmare, but it was such a delight. Every contractor and employee I had the pleasure of dealing with was helpful, respectful and seemed almost as excited as I was about building our house! Your almost daily updates helped make the process run smoothly. Your were able to guide me to make the Miranda model unique and fit exactly what I was looking for. Thank you Tundra!!!" "My wife and I are so glad we spent the time doing our research prior to starting construction of a house in SW Florida. After an exhaustive search and plenty of references we chose Tundra Homes as our builder and could not be happier with the outcome. 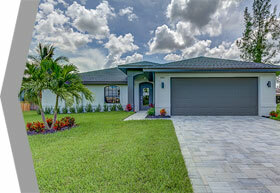 Our house in Cape Coral is a dream turned reality thanks to the crew at Tundra Homes. " "We would highly recommend Tundra Homes if you wish to build a home. They take a personal interest in you and the home you wish to build. They work with you every step of the way. You can rely on their expertise and have confidence in their process, communication, timelines and final result. It will be exactly what you want or they will make it that way--hassle free!" "We thought building a home from 1,000 miles away would be very difficult. The Tundra team made the process easy through excellent communication, timely attention to any questions, quickly addressing concerns or needed changes, and making suggestions to enhance our home that proved superior to our initial thoughts. 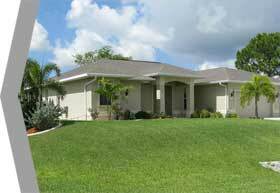 Every aspect of our home was completed professionally with excellent materials and workmanship. 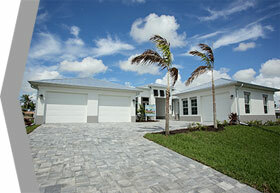 Without hesitation, we can recommend Tundra Homes to anyone considering building a home here in Paradise. Thank you, Tundra Homes!!" "We had such a wonderful experience building with Tundra that we have recommended them to anyone that asks. They are timely, fair and great to converse with." "14 months after completion of my home, I have to say, that I'm completely satisfied with the result. Thanks a lot to Dave and his crew for the excellent work. I really feel as a customer, all the time, also after completion and after the warranty period. I would recommend Tundra Homes to family and friends and if I ever consider to build another home in this area, I will go with Tundra Homes." Click thumbnail to read the letter. “When we searched online for potential builders, we’ve been hooked up on Tundra’s Mallory II Spanish style elevation, because it was in contrast to most of the houses we have seen before in this area. Believe it or not Tundra was the first and only builder we’ve been in contact with. When we met David, we immediately had a good gut! To choose Tundra finally turned out to be one of our best decisions! David, Heidi, Luke and the rest of the staff were always friendly, helpful, reliable and competent. It was amazing how fast they have built a part of our “American Dream”. It took them only 5 months in total! We love telling people who built our home. We are so proud to be homeowners. We spent months looking for the right builder. The reason we chose Tundra was your service. Heidi went above and beyond. Your follow up was very impressive. We were never made to feel like we were a bother, even though we had a million questions, literally! We loved the "cloud" application, what a great way to keep the homeowner in the loop! 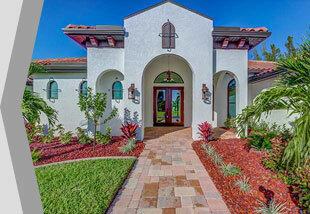 Tundra delivered a beautiful home and we are so excited to start building a future here as new homeowners. We wanted to thank you & show our appreciation for all you have done for us through the home building process. From our first email inquiry 2 years ago, you answered our hundreds of questions and exceeded our expectations. Your team made the process easy. We absolutely love our home & couldn’t imagine building with anyone else. Your team has been patient, honest, hard-working & informative throughout the whole process. We are proud to say we have a Tundra Home and will recommend your company to everyone. Every single person on your team has been wonderful! Thank you for building our dream home! During a conversation with our realtor today (Rob Ricca) he mentioned you asked why we had chosen you as a builder. I think he probably covered the basics, but let me give you "the rest of the story:"
We started looking for a builder late last year by contacting Tundra Homes. Rob took us to meet your dad and we talked about modifying the Vernazza model. We told him that we would not bother him again until our house had sold and we were on the hunt for a lot. But in the interim, you guys kept in touch with us (that was very important). When our house was on the market we began looking at builders. We contacted five of them. We made initial contact with each, told them what we were doing, then did nothing until our home sold three weeks later. At that point, we re-contacted each builder and told them we had sold our home, had purchased a lot, and were ready to move on the project. Once again, you guys kept in touch. You didn't go overboard but you didn't disappear either. Another builder nodded vigorously when we explained our situation when we were at their model, but never called us back. Another took us to see some of their projects and promised drawings of a home that met our needs, but to date that has not happened. Still another was in constant contact with us, but had neither the floor plan nor the pricing we wanted; they were very vague about what was included and what was extra (and their salesman was a big part of the problem for us) so we disregarded them. That left you and the last one out of the initial five as our "finalists." Unfortunately this last builder made the same mistake as another, in spite of knowing we were serious buyers with all the pieces in place. We really liked their product and they knew it - they were appalled to learn we selected another builder and have been offering us "incentives" to reconsider. But we told them our underlying fear has always been if we have trouble getting a builder's attention when we are serious buyers trying to select a builder, imagine how much fun the building process would be with that builder! So, as Rob told you, your market savvy won the day. You were perceptive enough to keep in touch with us when we could still be considered "tire kickers" by many builders; when we let you know our progress in selling our house and buying our lot, you ramped it up but were not overbearing. Finally, that gorgeous model of yours grabbed us and we were hooked. But you and your staff played a huge part in that - it's one thing to love a model home but it's quite another to be comfortable enough with a builder to sign on the dotted line. The credit for us building a Tundra Home belongs to you and your dad - after working with you it was a no-brainer. In choosing between you and that last builder, I'd like to emphasize Tundra's personal touch and your emphasis on being a family company as the factors that made the difference (we absolutely loved it during our meeting when your dad asked you where his glasses were - now THAT'S a family business). We are looking forward to the building process! 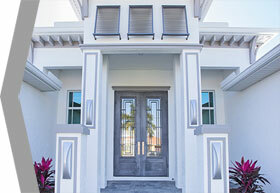 "Tundra Homes did a fantastic job on our custom house. We didn't want a cookie cutter design, so we worked with a great architect and came up with a design that matched our vision. The idea was something Spanish and traditional on the outside, modern on the inside - yet simple and clean. We were influenced by some vacation homes we had stayed in during visits to Central America. Most builders grumbled when looking at the plans. Dave and Heidi offered some suggestions to facilitate the process, but were on board 100% from the start. After visiting their homes and some models, we were sold. Building a home is never easy, at least not for me. I sweat the details. Dave and Heidi put up with me and my wife and always gave good advice. The result is our dream home, and it's just as we envisioned. My wife and I, and our three kids all love it. Thanks Tundra." We want to thank you for building our "custom dream home". From breaking ground, to receiving our CO in an almost unbelievable 5 months. 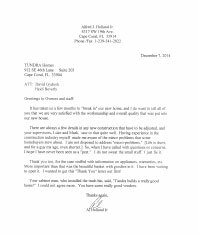 We had been thinking about building and moving down to Cape Coral from New Jersey for some time now, but when you company made us an offer we could not refuse, we immediately called you. In turn you recommended an architectural drafting firm that drew up our plans, and after that, that's when Heidi and Dave took over. We were lucky enough to rent a house right next door to where we were building our house. Almost every day the workers would start early in the morning and continue thru the day. If anyone is thinking about building a new house, call Heidi or Dave. They were there for us every step of the way, and I know they will be there for you. I would like to express our delight with the Tundra Home we purchased. As I see it, the construction and service we have received have been exemplary. We have had some additional work done that required electrical wiring and the installation of a 5.1 stereo system and both contractors stated how well the house was constructed, which gave me piece of mind knowing we had made the correct choice when we purchased this property. One thing I would like to bring up is the service and concern we received; I was away on business when my house was burglarized, not being form the area I told my wife to contact Tundra Homes to see if they could help with recommendations to secure the home. They were at the house the same day and had the house secure before dark. They took care of the repairs that needed to be done that same week, (very impressive). We love or Tundra Home and would highly recommend them to anyone who asks. Thanks again for the beautiful home." "I have known Dave Gydosh for over 30 years. The one thing that has always impressed me was how meticulous he is with his work. One example that stands out to me was when he was building my first home at 1206 SW 1st Street. He used to stop in daily to make sure everything was going well. One day I was there cleaning up a mess left from the sub-contractors and Dave was inspecting the place. Being unfamiliar with most things related with construction, I thought everything looked good, and it did. I saw Dave working with his tape measure going over everything. After I was finished I went to talk to him as he was in the 2nd bathroom. As I walked in, I saw him measuring the bathtub with a frown on his face. I said, "All looks good, doesn't it?" He looked at me and said, "No, this bathtub is a 1/2 inch off." I replied, "No one will notice something as small as that." Dave replied, "But, I would." The plumbers were back and reset the bathtub. That is the type of quality work you get with Tundra Homes. I had Dave build my 2nd home which was very complex. He performed the same meticulous checking as he did on my first home. I couldn't be happier with the results. "A very professional builder who goes the extra mile to please the customer. Listens well to customers' wishes and needs and readily incorporates changes as desired. This "no surprises" builder lends personal attention to detail and quality. Good after-the-sale assistance in matters relating to home's construction as well as helpful community information to the Lee County newcomer." We are glad we had the opportunity to work with your company and would recommend you without hesitation." "As a newly married couple, having our first home built was a very exciting and momentous time. 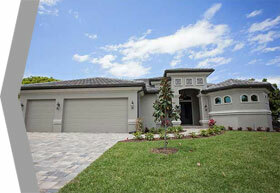 Initially, we looked at other local builders, but Tundra Homes was our top choice. We loved the Cove's architectural layout and open design. 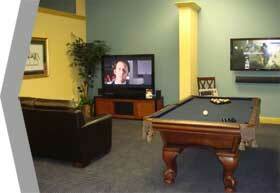 We felt very comfortable with the experienced staff at Tundra Homes. Dave and Heidi worked closely with us to satisfy our needs and preferences. Incidentally, we had a neighbor tell us that while the crews were working on our home, he took a walkthrough and said, "your builder is good, they don't cut corners." We were confident about the quality construction, but we actually learned this first hand when our home, nearing its completion, withstood Hurricane Charlie, a Category 4 Hurricane, in 2004. The walls and the roof were fully intact! Four years later and we still love our home. The price was right and the quality is exceptional. We fully recommend Tundra Homes to anyone that is looking for an honest builder that prides themselves on quality construction, and friendly service." It started off as a concept my Dad and I had over dinner one night. After six months of planning and construction - It became a reality. At that dinner conversation it was agreed, that in order to expand our business we needed to build a Showroom for our Custom Electronic Company. Without compromise we both thought of our friends at Tundra Homes. Working with you in the past as one of your Sub-Contractors, we realized that the Tundra Homes staff was capable of completing this project in the time-frame, with the craftsmanship, and professionalism we required. Being a family-owned business like you, I appreciate the ethics and sincerity you have encouraged in your employees. Thank you, and keep up the good work!" We're writing in response to your request as to how we feel about our home after having lived in it for five years. We are just as happy now if not more so than when we moved in. Almost everyone is excited to move into their new house but often that excitement wanes if problems arise or you wish you had constructed something a little differently. We didn't experience either of those things. Any problems we had were minor and were quickly resolved by your company. We love all the features of our house from the floor plan, to the electrical and lighting design, to the attractive exterior elevation. 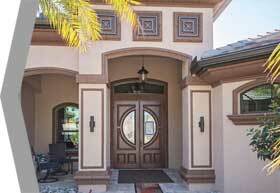 As your painting subcontractor I see first hand the high quality of construction and materials that you use. I appreciate too the accuracy of your construction schedule and that things are ready for us to paint when you say that they are. Not all builders are so well organized. I often deal with homeowners in the final stages of construction when I go to do the final paint touch up. I see first hand which builders give the best customer satisfaction. 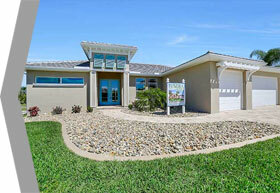 Overwhelmingly, Tundra Homes ranks among the highest in customer satisfaction. As homeowners, both Donna and I appreciate how well organized Tundra Homes is, how quickly concerns are addressed, and the genuine interest showed to us to make sure that we got what we wanted. Should we ever build again Tundra Homes would be our contractor. Thanks so much for the great job you did on our house!" "When we decided to build a new home it was one of our luckiest days when we got the recommendation of the Tundra Homes. The building grew astonishing quickly and Dave and Heidi did a great job from the first day to the very end. They are very nice people, whom we trusted in every way and every time. Whenever we wanted to change something, it was no problem. Dave managed it immediately and Heidi reliably updated our records. Heidi always found special stores that pleased our wishes. And last but not least, We think we paid a fair price for our wonderful home. Whenever we would build another home – we would do it with the very honest people Dave and Heidi." "If we were to build again, we would not even talk with another g.c. because of our excellent service from Tundra". "I chose you because I thought that I could trust you and I was not disappointed. The house turned out better than I thought it would, and I had high expectations. Dave, your attention to detail, knowledge of the construction process and ideas about trim work impressed me greatly. Heidi, you took care of every question and concern effectively and efficiently. Additionally you and Bonnie helped us out greatly with advice on colors, design, etc. Your staff, from Dan, to Horace and Joel and on down (not forgetting Raquel), did a really great job. They took great pride in their work. Your subcontractors all did a fine job. Thank you, it has been a pleasure getting to know you and everyone at Tundra homes and working with you on our beautiful new home. You can use me as a reference any time." Just a note to let you know how much we enjoyed working with you. We especially appreciate the matter in which you kept on top of everything going on from day to day. We knew that when you said something was going to be done on any given day, it was. The quality of your workmanship was all that we had hoped for. We also want to thank you for all the emails giving us the chance to visit the different suppliers in order to make the best choices. All these things plus your professional and friendly attitude, made our building experience a great one. We are finally getting settled and realy enjoy our new home. Thanks again." 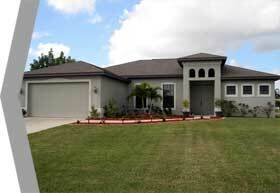 "We live in France and thanks to Tundra Homes, we managed to have a brand new home completed in 4 months. As we didn't have time to come to Florida before and during construction, we did everything on the internet. This was a challenge and we very much appreciated the patience, efficient work, and kindness of Heidi and her father. Our emails were answered in less than one day and we did send hundreds of them! Each week we could monitor the progress of the construction thanks to the pictures sent by Tundra Homes. The home was delivered on time and in perfect condition. 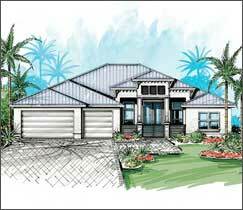 Tundra Homes is probably the most reliable builder for people like us who have to do everything on the internet because they are too busy or too far away from Florida." "I have built two commercial buildings and three homes in the past and experienced many problems. This was not the case with Tundra Homes. Every aspect of the construction process was better than expected. The house was completed in under 4 and 1/2 months and within budget. Being out of state, I especially enjoyed the constant communication and getting emailed daily photos of the construction progress. I would not hesitate to work with Tundra Homes again!" We did our homework when choosing a builder and did A LOT of comparing. They built us a home that exceeded our expectations of quality and beauty. We made the right choice when it came to the builder. really stand behind their work. Check out Tundra, it is well worth it!" The closet looks great! Chris did excellent work, and the closet folks did a great job. It blends in nicely with the home. It's every woman's dream closet!" 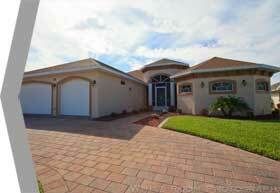 "David is a man of integrity, a rare quality in SW Florida among contractors. monitors everything that's going on." 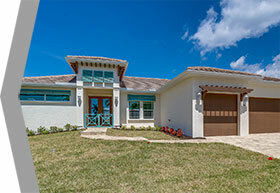 "Tundra Homes completed my project in a timely fashion. With very good communication throughout, all employees were very friendly. Good quality workmanship. I would recommend Tundra to anyone." "Working with Tundra Homes was a great experience! Our house looks amazing and we´re completely happy with the result. Everything is way better than expected and we would recommend this company. They were always very nice and helpful so having a house built in Florida while living in Germany was very pleasant. Thank you so much!" Gary and I would like to express our sincere appreciation for the wonderful experience we have had building our new home in Cape Coral. We have built 3 times previously in our home state of Maryland. Building from a distance in Cape Coral has by far been the least “painful”! From the moment we met Dave and Heidi, we felt very comfortable that our needs would be met. But, in only a short time, we realized that our expectations would be exceeded! Your team was always available to us and went above and beyond to ensure that we were kept “in the loop”. The highlight of the week was receiving Luke’s photos showing the progress of our home every step of the way! Luke gave us his timeframe calendar (which we thought was very ambitious!) and, sure enough, he completed construction ahead of schedule! Each and every one of your subs was professional and knowledgeable. We have been very impressed with each trade that worked on our home. There were so many choices to make that at times it felt a bit overwhelming. But, with the guidance of Dan, Lori, Faith and Kat, we felt confident that our choices were the right ones. Seeing everything come together, the way we hoped it would, is simply amazing! We could go on and on about the Tundra Homes Family and how happy we are! You promised quality construction and boy, did you deliver! We love our new home and would not hesitate recommending you to anyone looking to build. Thank-you again, from the bottom of our hearts!" We had from the beginning on a good feeling, and feel comfortable. Very professional throughout the whole process. Quality better than expected. We feel good taken care of from the first meeting on. Just in case – we would gladly build the next house with Tundra Homes again.